Start Summer 2019 with Dance Camp! 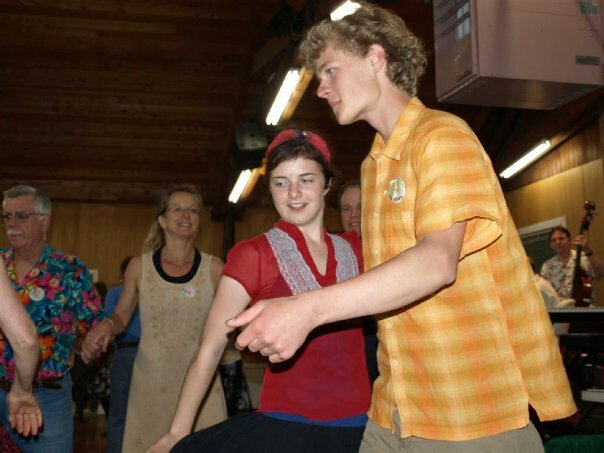 The Dancing Bears Dance Camp at the Kings Lake Camp near Wasilla is a wonderful way to finish an exciting dance season, and begin another Alaska summer with activities you cherish. Dance Camp is held annually during Memorial Day holiday weekend. Dance Camp activities served with a scenic view of Kings Lake and the Chugach Mountains! Dance Camp features nationally acclaimed guest bands and callers! Camp in your own tent or RV, or bunk in one of many available cabins. The camp property is large, so there is plenty of room spread out, stroll through the woods, and get away for quiet time when you want to. Your Dance Camp registration fee includes meals, camping space or cabin, dance workshops, and evening dances. An action packed three day weekend of Fun! Guest Callers and Bands -- They are Fabulous! no-nonsense walk throughs and effective teaching for both the newest dancers and the most seasoned of dancers. Beth Molaro’s enthusiasm is contagious and she makes any dance more energetic and exciting. ​TOSS THE POSSUM -- Grounded by Mom & Son, Laura (keyboard) and Rob Zisette (fiddle plus), these two dancer muscians know that spontaneity is more fun and can often create magical moments! Edward Howe, exceptional fiddler, maeststro of improv, believes that music is a feeling, not a sound, that should be felt in the soul. HOLLY DING -- Tom Sauber, returning guest artist has played at camps and festivals from Alaska to Spain, from Scotland to Australia. Master muscian, a multi-instrumentalist, if it has strings he plays it. Brian DeMarcus, Dancing Bears know him well. Originally from North Carolina this expert musician/caller has played and taught at most prestigious music and dance camp throughout the country. John Corzine, part of Southern California aucoustic music scene, has also performed throughout the southland. A picker’s picker and a singer’s singer, John is certain to be a hit! Registration will start on March 15, 2019. New for this year we offer Online Registration and encourage you to try it! You may to choose to pay by credit card or by physical check, which you will need to mail to the Registation Bears, Bob and Peg at the address shown below. A convenience fee is added to credit card payments. If you are a Dancing Bears member (paid up!) you will receive a registration form in the mail…if not, you can download a form from this website. If you do not use the Online Registration option, you will need to snail mail the forms to the Registration Bears. The 2019 Dance Camp Registration Form will be here March 15 -- after 5PM Alaska Standard Time. The Registration Form and the Waiver Form must both be filled out and signed and returned to register for camp. Dance Campers! We have made many changes since previous years, so please read all about them to help make your Camp experience the best it can be! Please check out all the NEWLY REVISED and UPDATED Camp info by clicking on each of the tabs below! We ask that you read the info thoroughly...even if you have been to Camp before. You can print any pages that you may need. Thank you for helping our Camp to run smoothly. Acceptance Letter Basic information about Camp—what to bring and what to expect. Parents’ Information What you need to know if you’re bringing kids to Camp. Guardianship Paperwork -- THE FORMS AND INFO YOU NEED TO HAVE IF YOU ARE BRINGING MINOR CHILD TO CAMP WHO IS NOT (LEGALLY) YOURS. Read more about the Dance Camp Auction. Camp Rules -- Yes it does!! PLEASE SHARE THIS INFO WITH YOUR DANCING FRIENDS! Please tell your dancing friends that we strongly encourage them to sign up for the listserv if they are not on it already. We will post all the latest info on Camp to the listserv and we would hate for them to miss some significant tidbits because they aren't getting listserv messages. Signing up is easy...just jump online and go to: thedancingbears.org where they will find a white box 3/4 down on the right-hand side of the Home Page to “Subscribe to Listserver”. Clicking on the box will get them to another box in which to type one’s email address. (If there is a problem contact Linda at [email protected]). It is also easy to remove one’s name from the list after Camp should one not want to continue to receive Bears and dance-related emails. DANCE CAMP NEEDS YOUR TALENT!! JOIN OUR CADRE OF AMAZING WORKSHOP TEACHERS AND MUSICIANS! dance, as well as musicians who will play for those classes. In past years, in addition to our "usual" dance and music classes, our classes have included yoga, massage, Irish dance, juggling, rounds, and shape note singing--all taught by talented locals. It's a great way to be a part of Camp and you even get paid a little!! We always have kids coming to Camp every year so a kid or family workshop could be just the thing. If you have a workshop in mind that you would like to offer, please send me a short description and information on what your workshop would need in the way of music/supplies/space and we'll give it our consideration. If you know of folks who might be interested but aren't on this listserv please share this request with them. Feel free to contact me via email at [email protected] or call 907-258-1937 (Anchorage). I'm looking forward to seeing you at Camp!!! DANCE CAMP REGISTRATION STARTS MARCH 15TH!! The excitement is building!! We are closing in on registration! If your membership and address are current, your paper copy should on its way to you later today, so it should be in your mailbox by the 15th. Registration will go live on the website (thedancingbears.org) sometime on the 15th. Click on the Dance Camp tab and then the registration tab. Don’t forget to include the signed Waiver Form if you mail in your registration. We will have online registration available again this year. The link will go live on the 15th and will be noted on the Registration Form. (https://dancingbears-dance-camp-2019.cheddarup.com) If you choose to use a credit card, there will be an added convenience fee. You are welcome to send a check if you prefer not to incur that cost. Details will be online. The Playshop Schedule is still being created and is not available at this time. want a scholarship please read the Scholarship info below. Auction and Camp and bathhouse cleanup. [email protected]) soon to get the scoop!! Happy Dancin'!! We can't wait to see you at Camp!! BUT WAIT ! THERE'S MORE ! REGISTRATION BEGINS MARCH 15! Use links shown below to register online, or print forms and mail in. The full schedule of everything to do at Dance Camp! What! Where! When! Details of Camp Schedule and Playshops are Currently under development and will be available as soon as possible. ​What are Playshops? They are like workshops, except they are Fun!